With extraordinary power and robust design, the FS 490 C-EM clearing saw with STIHL M-Tronic and ErgoStart is a sound choice for professionals. Low vibration levels due to the four-point anti-vibration system. With simple start logic, stop button and fully electronic M-Tronic engine management as standard. STIHL M-Tronic - This fully electronic engine management system adjusts ignition timing and fuel metering in all operating modes. It also takes external conditions such as temperature, altitude and fuel quality into account. It ensures consistent engine performance, a constant maximum speed and superb acceleration. M-Tronic makes manual carburettor adjustments unnecessary. Thanks to electronic cold/warm start recognition, now there is only one start position on the combi-lever. The engine starts after fewer pulls and with no change of position, and can immediately accelerate up to speed - even after a cold start. M-Tronic also remembers the settings from the last time the tool was used. So when external conditions are the same, optimal engine performance is available every time you start up again. 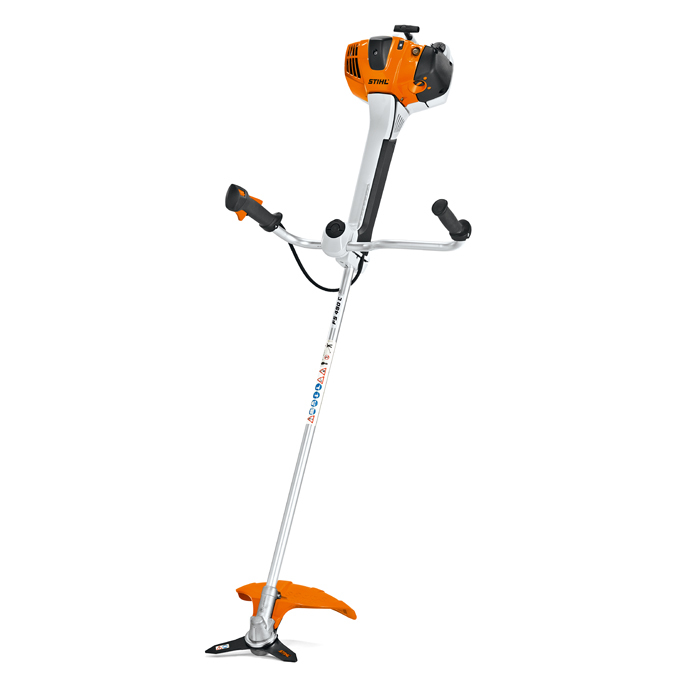 STIHL 4-point anti-vibration system - In STIHL brushcutters, steel springs act as anti-vibration elements to reduce the transmission of vibrations caused by the motor and rotary cutter. The handles therefore have extremely low vibration and the devices is easy to guide. Locking plug-in bolt - Changing the tool is made particularly easy by locking the plug-in bolt in place. Tool free handle adjustment - The central wing nut enables easy adjustment without the use of tools. For transportation and space-saving storage, the handle can be rotated by 90°.